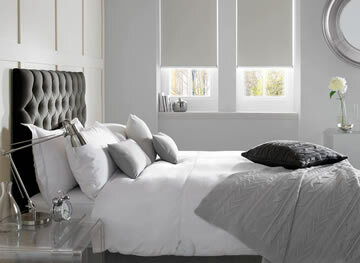 Roller blinds are a great choice for the bedroom. Their elegant clean lines blend beautifully into any style of décor with ease. We have a wide choice of plain, patterned and thermal blackout fabrics to ensure you get a relaxing nights’ slumber and at the same time help to keep you snug and warm on those cold wintery nights. 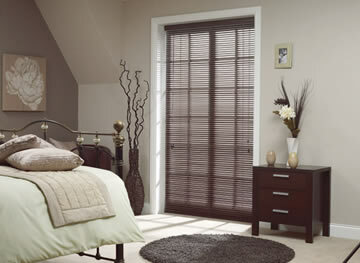 Bring a touch of natural sophistication to your bedroom with our timeless wooden blinds. They are a great way to control sunlight and privacy whilst helping to retain heat during the winter and keep the room cool in the summer. Choose from luxurious natural wood grains, painted, textured and on trend contemporary gloss finishes. 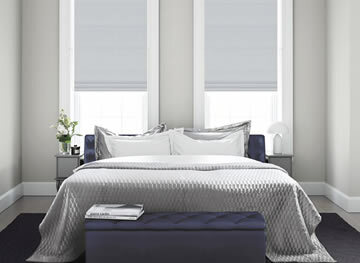 The perfect choice for the bedroom, our beautiful collection of luxury blackout blinds offers a fabulous way to block out the harsh glare from the sun whilst bringing colour and design to the windows. They are also thermally efficient which will help reduce your energy bills and come in a wide range of stylish patterns and colours. Sometimes overlooked as a window treatment for the bedroom, vertical blinds are a great choice for larger windows where they will give you excellent privacy and light control. Simple rotate the louvers to precisely control that mount of shade you require. Choose from a beautiful range of modern, traditional and colourful fabric designs. Full of timeless elegance and utterly luxurious, the addition of some roman blinds is guaranteed to bring a beautifully warm soft look to the room. Handmade, fully lined and with a blackout lining option, they are both a stylish and practical way to dress the windows. Choose from fabulous range of contemporary and vintage designs. If you have a more modern styled bedroom another consideration for the windows is some custom made aluminium venetian blinds. Their elegant clean lines are perfect for a sophisticated contemporary look. They are extremely practical and functional and are available in a wide choice of beautiful colours, finishes and textures. As the bedroom is the one room of the home where you want to feel completely relaxed and ready for a good night’s sleep, creating a comfortable atmosphere where you can retreat to for some well-earned rest is essential. So whether your boudoir is a contemporary designed chamber or more classically styled with a four poster bed, our luxury made to measure bedroom blinds are the perfect way to help create the soothing and relaxing environment you are looking for. 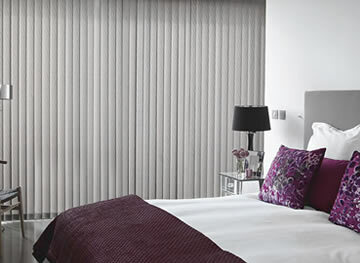 With a huge range of beautiful designer fabrics in both plain and patterned designs, we have a style of bedroom blind to compliment any type of interior décor and inspire your design ideas. Perhaps you want a bold, colourful, vivid and funky floral design to brighten up the windows, or a more subdued plain colour to cool things down, whatever look you are going for we have something to suit all tastes. 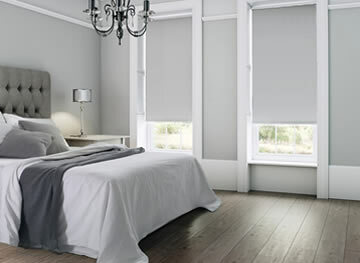 If light control is a priority and in particular the early morning sunlight, then our gorgeous range of blackout roller blinds offer a great way to dramatically reduce the amount of light in the room as well as affording you a greater degree of privacy. Wooden blinds are also a great choice as bedroom blinds if you want a more natural look, and particularly if you have wooden furniture in the room or a wooden bed and want to continue the theme through to the windows. Although they’re not a blackout blind they will still dramatically reduce the amount of light entering through the windows and they do give you real flexibility. For a truly sumptuous look our luxurious blackout roman blinds are the ideal choice. With both printed and embroidered fabric designs in a myriad of colours and designs, find the prefect fabric to finish off your bedroom had never been easier. They are a wonderful way to create a soft and elegant look at the windows. For a kids bedroom or babies nursery we have a fabulous collection of children’s blackout blinds that is perfect for ensuring your little ones get a refreshing night’s sleep. With both plain fabrics in all the colours of the rainbow along with some beautiful patterned designs to inspire their dreams and help send them off to sleep.